Thinking of heading to Greece this year? Peruse our Greek Islands Guide and enjoy it in the best way possible. Rosalyn Wikeley and Rebecca Cox report. 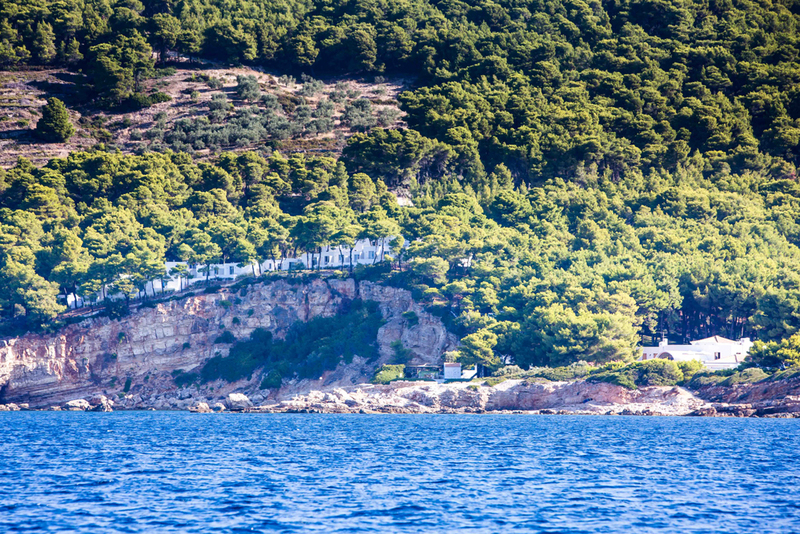 The oft-forgotten island among the Sporades group (Skiathos, Skyros, Skopelos), Alonnisos is the classier, unassuming older sister who escaped the limelight and the troubles it brings. Imagine a silence, impregnated only by a few crickets, pine trees jostling in the wind and waves gently rolling in from a sea too blue for any Instagram filter to bother with. This is Greece at its best, an island known to a discerning few yet still at the mercy of its wild, dry scrub and warm-blooded seas. The locals work to the same leisurely rhythm as the salty breeze that is Alonnisos’ artery, perching outside their quaint stores in the town centre like extras on a film set, inhaling the movement around them in a manner alien to the digital serf. While the white-washed houses and wild rocky coastline doze in the midday sun, fisherman re-live the tradition of their ancestors, pootling off into the horizon and tourists (not many) savour the strong coffee and pastries in the old town, peering down over this Aegean paradise. Like many Greek islands, the economic woes that beset the nation are still evident but Alonnisos is slowly awakening to its escapism pull for the well-heeled traveller, protecting its rugged soul in the process. Not only is the island elegantly unpretentious but it is steeped in history and Greek mythology, with Jason and the Argonauts sailing from Alonnisos to Kolhida to retrieve the Golden Fleece and the ships of Achaeans sailed from here to Troy. At the very tip of the Sporades, the island was a crossroads for major shipping routes and its jumbled architecture tells a tumultuous tale. The waters surrounding Alonnisos are part of a Marine Park teeming with wildlife, shipwrecks and protecting some endangered species such as the Mediterranean monk seal and dolphins (we saw many of the latter). As such, the island offers a level of diving or snorkelling rarely associated with the Mediterranean. Once Marpunta fishing village, Santikos is a charming scatter of white-washed rooms and villas lining the rugged fringes of Alonnisos. 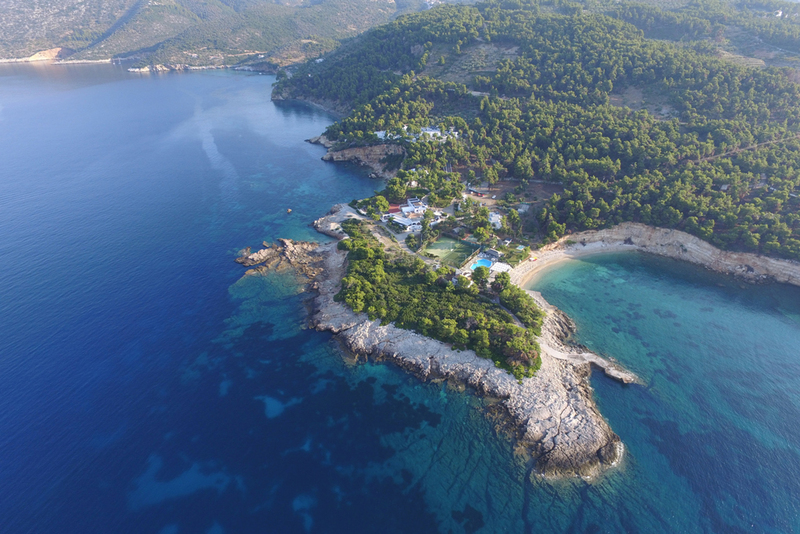 Meeting these jagged edges are crystal clear, deep blue waters and views out to Skopelos (opt for rooms with a sea view from the cliffs or the private villa). 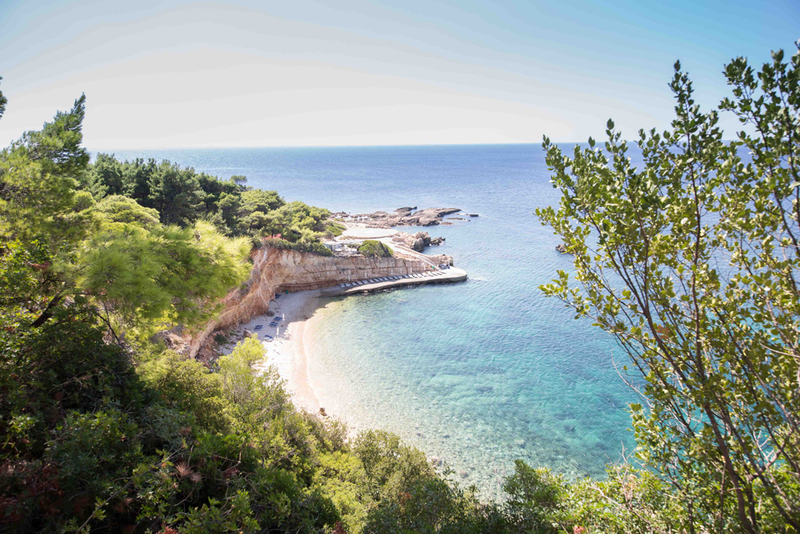 A glorious private beach lures guests away from their Aegean vistas with white pebbles sloping into a turquoise sea and a large protruding rock piercing the cove (good to aim for when swimming or paddle boarding). 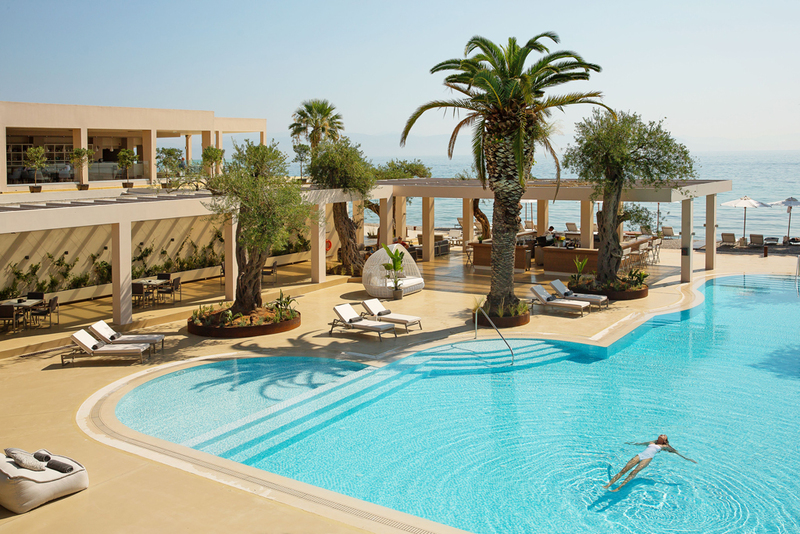 Overlooking this heavenly cove is a vast pool flanked by a cocktail bar and restaurant, Achinos – open from 12 pm to 22 pm. The menu here is an artful blend of Mediterranean tradition and modern culinary gusto, sophisticatedly presented but bursting with rustic flavour (pair the fresh seafood with the Santikos family’s own wine, ‘Moschato’). For à la carte, head to the Achinos restaurant near the hotel’s main ‘reception’ (more a relaxed sitting room). Those seeking to take the edge off the Greek hedonism can choose from an abundance of yoga and fitness classes or hike the islands’ fragrant hills and olive groves with a guide, weaving up through pine-clad forests to the Old Town (this is the best way to get to grips with the island’s geography and ecosystem). The hotel recently opened an outdoor cinema on the waterfront, beautifully projected against its old stone patio and helipad (the stuff of a 70’s Bond film) with themed evenings, from classics to sci-fi. Deluxe Double Sea View Rooms start from £85 on a B&B basis, based on x2 adults sharing. Olympic Holidays (020 8492 6868) offer 7 nights at Marpunta Resort from £963pp including flights, accommodation on a B&B basis, luggage, boat and land transfers. Based on 11th June 2019 departure. Go diving. 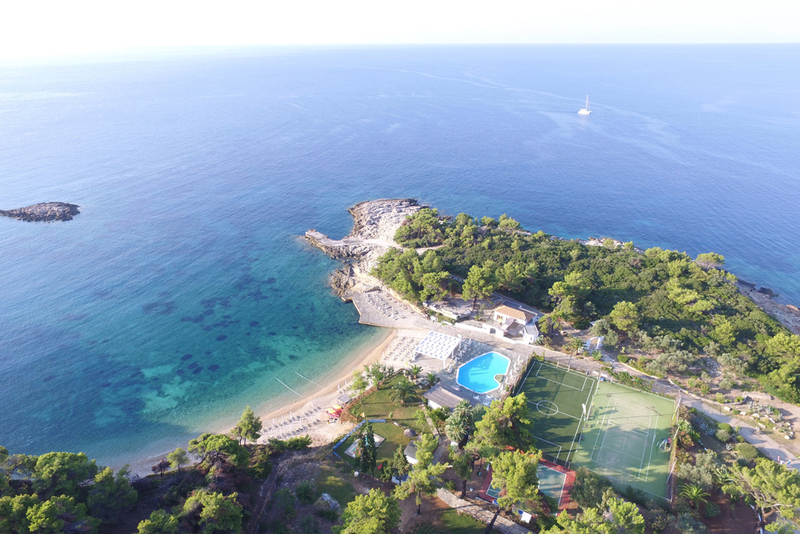 The hotel runs snorkelling and diving trips to explore the bursting corals along Alonissos’ shores. With its own Marine Park, this is magical stuff and even if diving is not your thing, fling on a snorkel and gasp at the colourful show below. Cruise on a yacht. Organised through the hotel, explore the islets off Alonissos’ coast and moor at either Kyra-Panagia belonging to Megistis Lavras Monastery on Mount Athos (where the resident monk will give you a tour and insight into his remarkably resourceful and simple lifestyle) or Yioura, with its neolithically inhabited stalactite cave that supposedly sheltered Homer’s Cyclops and is now home to a rare species of wild goat. While below deck, the boat could be owned by Jack Sparrow, up top there’s a white padded playground not far removed from a Cote D’Azur superyacht. Perch up here and inhale the real Greece as you motor past it. From the fresh lunch whipped up by the captain’s wife that morning to the sun-soaked secret coves serving up afternoon bliss, this trip is a must. Visit the Old Town. Meander through the cobbled streets, jewellery shops and cafés in the Old Town set high atop a hill with breath-taking views of the island, its wild edges sloping into an impossibly blue sea. The Gorgona Antique Shop is an Aladdin’s Cave of vintage Greek trinkets, sourced from across the country. ‘Dine Around’. 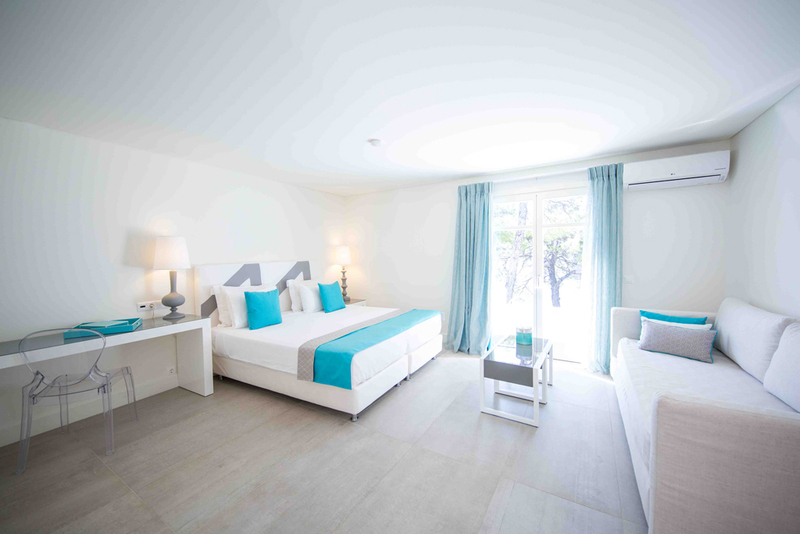 Santikos Hotel operates a ‘Dine Around’ facility whereby guests can hire a car or take the hotel’s taxi and try their curation of three exceptional restaurants on the island (Tassia in Steni Vala, Corali in Kalamakia and Archipelagos in Patitiri). Each has their own unique character and fresh produce, Tassia in Steni Vala has a vista reminiscent of one of the Mammamia films. Mourtias beach. Like a children’s storybook, two tavernas overlooking the heavenly Mourtias beach vie for their slice of the tourist pie in unashamed fashion. This is simple, fresh fish, Greek salads and warm cheese pies, what Alonnisos does best. Corfu, carpeted in olive trees and lush scenes unusual for Greek islands is not as touristic as many assume. The further inland you go, the more of rural Greece you’ll peel back (tourist spots are limited to certain areas, safeguarding the island’s sleepy villages and authentic allure). Corfu first fell onto the British traveller’s radar in the 1950s with Gerard Durell’s trilogy of autobiographical books about his island tales with an eccentric British family and widowed mother. The past few decades saw tourism wane and then ITV adapted the books for their series ‘The Durrells’ depicting a romantic escape to tatty beauty and the sort of time warp the London hustle fetishizes over. Corfu henceforth reared its exotic head again. Patches of the east coast have been designated a UNESCO world heritage site for their ethereal beauty and old castles and churches bear legacy to decades of invasion and colonial influence. Corfu Town best exemplifies this with its heady mix of Venetian, French and British architecture protruding from cobbled Mediterranean streets in tired splendour. This yesteryear opulence and café culture pits Corfu Town against some of Europe’s grand favourites, in parts, and it was just south of Corfu Town where Prince Philip was born at the Mon Repos Palace (now the archaeological museum). The well-heeled and well-linened tend to head to the north of Corfu (the northeast in particular is serious Sloane territory with the Rothschild’s owning a place there) while the South largely cater to more low-brow escapades, the sort that give British tourists a bad reputation. Stick to the north but hanker after ‘simplicity’ as the very best restaurant’s in Corfu are often unassuming family-run tavernas with cats lingering around the entrance. 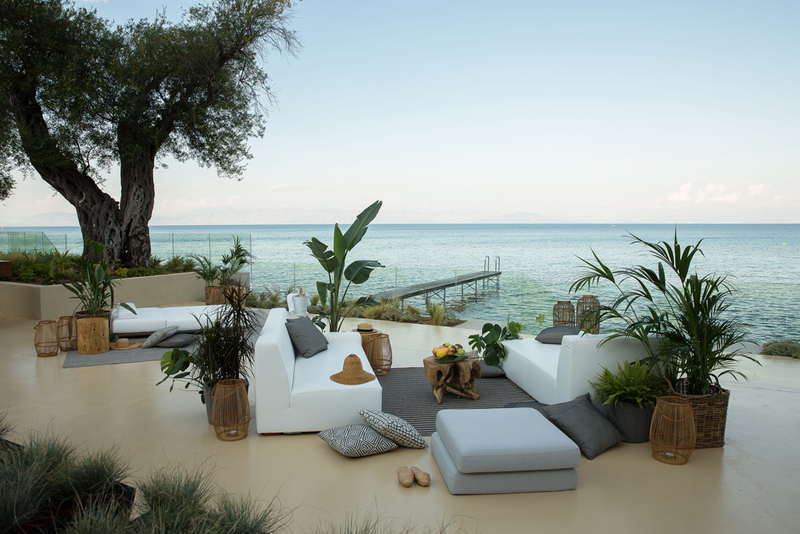 A nifty half an hour taxi ride from Corfu airport scoops you into a chic, marble-clad reception area pulling tired eyes over a white grand piano, impeccable modern design towards a glistening Ionian Sea. You’d be forgiven for mistaking the aquamarine vista for an exceptionally large pool, it’s so clear. The modernist cream buildings dotted along the waterfront of this adult only 5* hotel may promise deliciously comfortable beds, views over a calm sea and the little luxuries that make all the difference, from a nougat turn-down service to the Byredo products in white-washed bathrooms. Opt for the Pavilion Suites with their own pool and garden. This is where the agony of indecision ends. Everything is easily ordered from a sunbed or a bedside table, indulging the hotel’s star-studded legacy (previously owned by the Onassis family and hosting a string of celebrities and royalty). A relaxed clubhouse feel pervades in the main restaurant with a buffet breakfast fit for a Greek God (try their Greek yoghurt and local honey) and a lunch and dinner menu flaunting the island’s dairy prowess and fresh fish. Above this lies a sushi restaurant ‘Raw Bar, with a more cosmopolitan disposition and a roof that peels back a ceiling of stars above. Domes Miramare’s spa menu caters to over-worked, over-stressed travellers, their signature deep tissue massage and lymphatic drainage notable favourites, both rounded off with a steam room and Jacuzzi overlooking a docile Ionian Sea. The hotel runs a smart boat service into Corfu throughout the day (more Saint Tropez than Greece post-2008) and guests can hire kayaks and paddle boards or join yoga classes for a wellness break. The most impressive feature of this decadent Corfu retreat is its ‘Haut Living’ area where guests who have checked out or in before their rooms are ready can stretch out the usual facilities (showers, coffee, sofas, wifi). This is a mini health club in its own right with marble and glass interiors, a geometric swimming pool and sunbathing area with access down steps to the sea. Checking out has never been this chic. Rooms start from £172 for a double sharing. Carrier (0161 492 1357) offers 7 nights from £1,260 per person, based on two adults sharing an Emerald Retreat Sea View including breakfast, return flights from London Gatwick and return private transfers. (Price based on departure 19 May 2019). Offer valid for stays 17 Apr – 14 Oct 19, book by 28 Feb 19. Rent a boat. Domes Miramare has a boat service to rent with a skipper or without (no boat license required) for exploring the coves along the coast of the island at £190 a day. Pack a snorkel and waterproof camera. Head into Corfu Town. Take the hotel’s boat service and wander through the old town ‘Kérkyra’ with it Venetian alleys and tired, pastel buildings. Visit the Palaio Frourio, a 14thcentury Venetian marvel and the Corfu Museum of Asian Art found in the Palace of St Michael & St George. Drive to Agni. This tiny fishing village a few kilometres north of Nissaki is a quaint refuge for Sloaney Brits with its three lively tavernas. Drive here via Nissaki and once you arrive, drop the car and hire a boat to head out to one of the heavenly bays along the coast (Agios Stefanos is also well-worth pootling over to). The Village Taverna. A mere ten-minute walk from Domes Miramare in the old village of Maoraitika is a family-run Taverna with passionate owners and affordable Greek food at its best. Try the moussaka (the owners’ secret recipe) and the fresh prawns in garlic. Venetian Well. A fine dining restaurant hidden away in its own romantic square and a genuine Venetian well down the winding medieval streets of Corfu Town. This is sumptuous modern cuisine harnessing the very best of Corfu’s fresh fish, local meats and vegetables. Whether you’re looking for a chic grown-up getaway or a luxe escape with the kids in tow, this hotel has it all. Santa Marina Resort & Villas is fresh from a three-year multi-million Euro refurbishment and is located on a secluded peninsula 3km from the bustling Mykonos town; it’s the only resort on the island with its own private beach. There’s also a stunning infinity seawater pool, a family-friendly infinity pool and the island’s biggest (and most luxurious) spa. You can enjoy the glorious sea-water infinity pool and cabana-lined private beach, plus there’s the world-class Ginkgo Spa on site where you can indulge in a range of treatments including a Swedish massage that’s second-to-none. There are nine suites amongst the 101 rooms that have stunning private pools, plus family-sized villas for you and the family to enjoy some privacy when you need it. Check out the old town (the Hora), which is the perfect place for early evening meandering (as long as you don’t mind a lot of foot traffic in peak season). Think blue and white lopsided buildings down crooked lanes embellished with pink blossoms and dotted with friendly street cats. Find a coastal spot overlooking the windmills on the ridge overhead for a sundowner (again, crowd dependent). If you have time a day-trip to Delos is well worth a visit by boat, home to one of the major religious centres of the ancient world. The archaeological site is open daily by trips are dependent on the weather and sufficient passenger sign-ups. At Santa Marina you’ll find the Colonial bar and restaurant serving fresh local flavours. Plus, the resort is home to the world’s very first Buddha-Bar Beach. Pick from signature cocktails and the renowned Pan Asian menu and enjoy visiting mixologists and top DJs that draw visitors from the rest of the island and passing yachts.